A few years ago the nail category was stagnant and boring, churning out a new reincarnation of red and pink tones we’d had for years and calling them brand new. It seemed that nail varnish had very much gone out of favour, with our lustful indulgent tendencies turning to lipglosses and eyeshadows instead. However, fast forward to 2015 and our love affair with nails is definitely taking over any other category within beauty – it seems that we can’t get enough of differing tones, textures and effects to elevate our outfit. Barry M are sitting firmly at the top of the nail polish tower, offering a hugely expansive range of varnish that meets our every need… And they show no signs of stopping. They’re new ‘Speedy Quick Dry‘ collection provides wearable tones that take us easily from one season to the next, with the handy addition of technology that ensures nails are touch dry within a few minutes so we’re ready to face the world without sticky or smudged talons. Available in nine different shades that include everything from a muted ‘griege’ and wearable purple, to spring-appropriate lime and bright coral, the polish is a pleasure to apply and coats the nail with ease. The brushes pick up a lot of product (make sure you wipe it before applying polish to prevent getting in a mess,) to cover the nail and provide a streak-free finish, with two coats ensuring a true-to-bottle colour result. What’s really exciting about this range is that it really does dry in next to no time at all; after applying two coats and waiting for a few minutes, I’m ready to face the day ahead. After thirty minutes polish is usually touch dry but still moist under the external layer, causing smudges and chips to creep up on you unexpectedly – however, twenty minutes after applying this for the first time I popped to the loo and pulled up my tights (a sure fire way to know if a polish is dry!) and there was no smudging whatsoever. My polish stayed put exactly where I needed it to, providing a subtle shine and fabulous colour for a price that doesn’t break the bank; these polishes will only set you back £3.99 each, meaning they’re even more affordable than popping to Starbucks for lunch. I’m always dubious when it comes to ‘fast drying’ claims, but for once I haven’t been left disappointed… Thanks Barry! 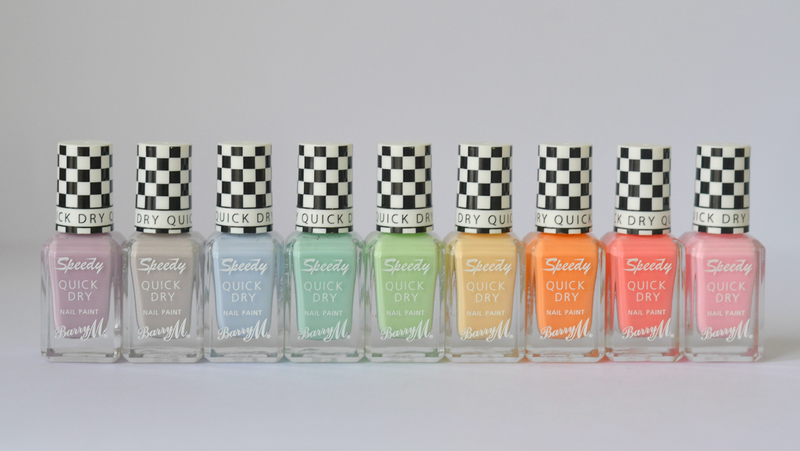 The Barry M ‘Speedy Quick Dry‘ polish collection is available now, priced £3.99 each. Next Post An Open Letter To MAC: What Is This Beauty Madness? Oh wow, you definitely rocked these photos! 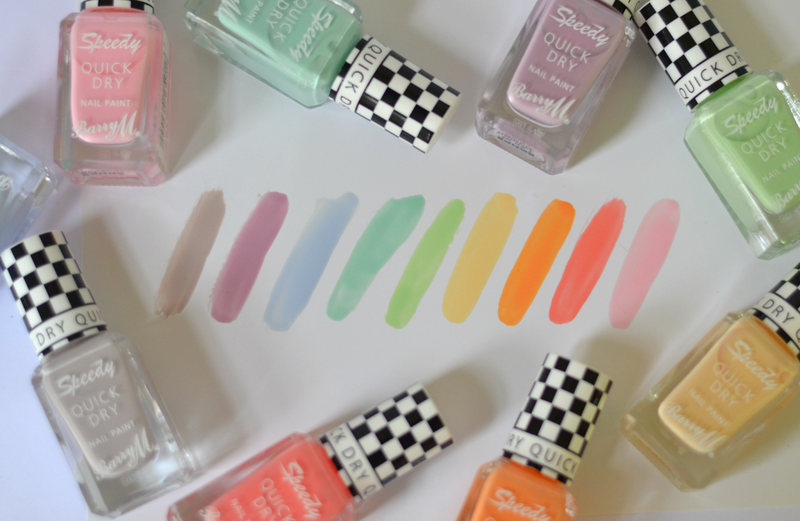 Helps that these polishes are so damn photogenic (I mean the colours plus that adorable eighties-looking Vichy pattern on the lid, so lovely) but still, nice job! That grey shade is lovely. I'm a big fan of quick drying nail varnish as I always seem to be painting them at the very last minute. The shades all look so pretty! And it's good to know the polish lives up to its name.